Ever on the look out for new expressions of creativity, The Jewellery Editor is naturally drawn to the unusual, be it avant-garde, experimental or just plain whacky. 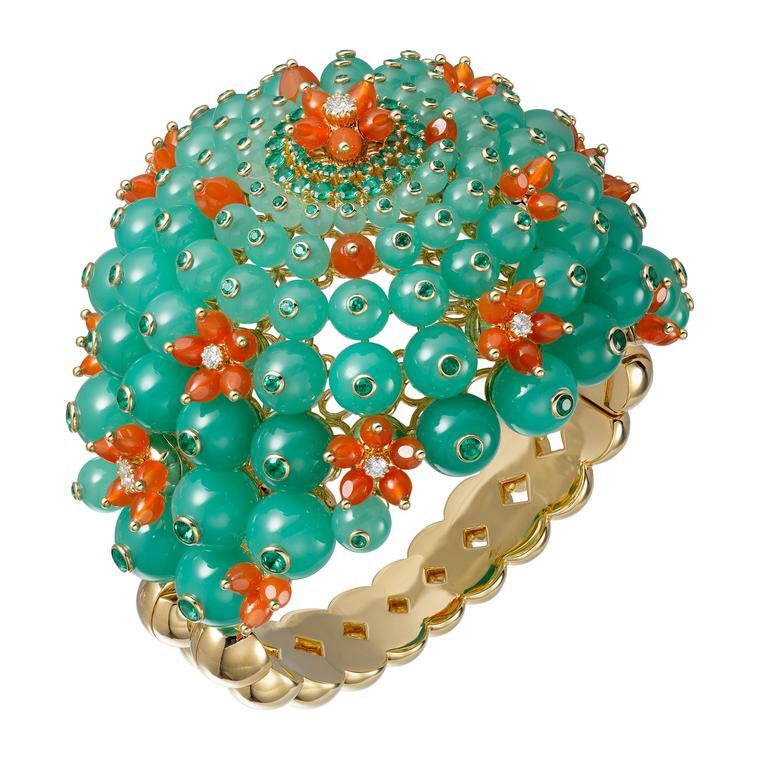 Cactus de Cartier cuff in 18ct yellow gold with chrysoprase, emerald and carnelian beads, and eight round diamonds (POA). Perhaps the collection that most fascinated me in 2016 was Cartier’s Cactus. Menace meets glamour in these jewels inspired by the prickly beauty of this succulent survivor. As elegantly provocative as the 1948 panther brooch made for the Duchess of Windsor, I think the Cactus picks up the thread followed by Cartier that includes María Félix’s 1975 crocodile necklace, the edgy nail Clou jewels and the smashed-up Crash watch. I love the uncompromisingly large volumes of these pieces, their clever construction – think swivel mechanisms hidden under desert blooms – and the judicious use of colour. I am sure that the Duchess of Windsor, the prickliest of customers, would have approved. 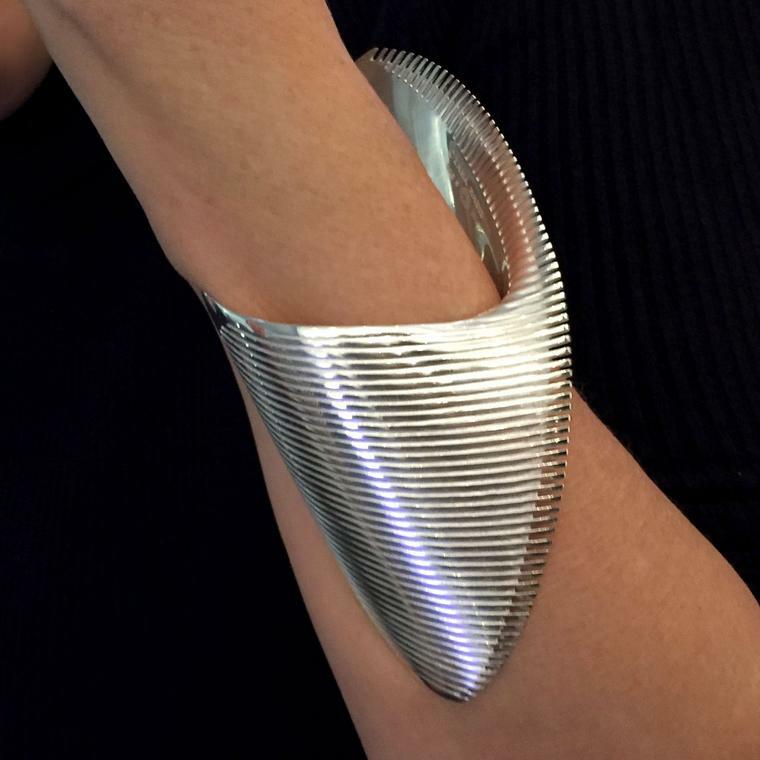 Zaha Hadid Silver cuff designed for Georg Jensen (£1,975). Zaha Hadid was a woman not afraid to show her strength, and the silver jewels she designed for Georg Jensen are a fascinating juxtaposition of power and grace; smooth and sharp; function and beauty, much like the Wangjing SOHO complex she designed in Beijing. These larger-than-life jewels were among her last designs before her death, a poignant reminder of the genius of a woman who did not know the word compromise. Inspiration comes in all shapes and forms. Ever original to the point of eccentricity, Lydia Courteille soaks up the splendour of the court of Sultan Suleiman the Magnificent and transfers its opulence into her exotic Topkapi collection. The inspiration behind Lydia Courteille’s new Topkapi collection, Sultan Suleiman takes pride of place in this rock crystal ring (POA). 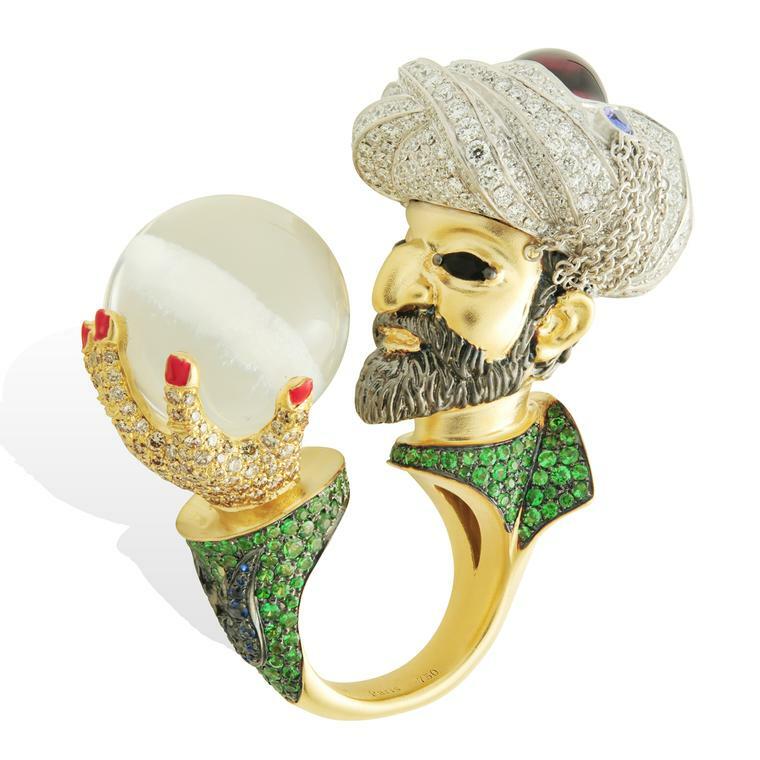 And who but Lydia would take the trouble to create a painstakingly detailed miniature jewellery sculpture of a beady-eyed, hook-nosed Suleiman, complete with little red fingernails and a pleasingly plump diamond-set turban sporting a jaunty tassel? And that’s not all. Suleiman’s crystal ball holds a naughty secret. Ask me nicely and I will tell you what he is so very interested in. A lorgnette is nothing new, but to revive bejewelled, hand-held eyeglasses last seen in the 19th century is certainly an original proposal. Hong Kong designer Anita So rises to the challenge with her lavishly decorated eyewear, or ‘Vision Art’ as she calls it. Diamonds, carved jade and hidden watch dials are the very first examples of the revival of the lorgnette we have seen at The Jewellery Editor. Somehow I don’t see this becoming a trend, which makes Anita So’s originality even more appealing. 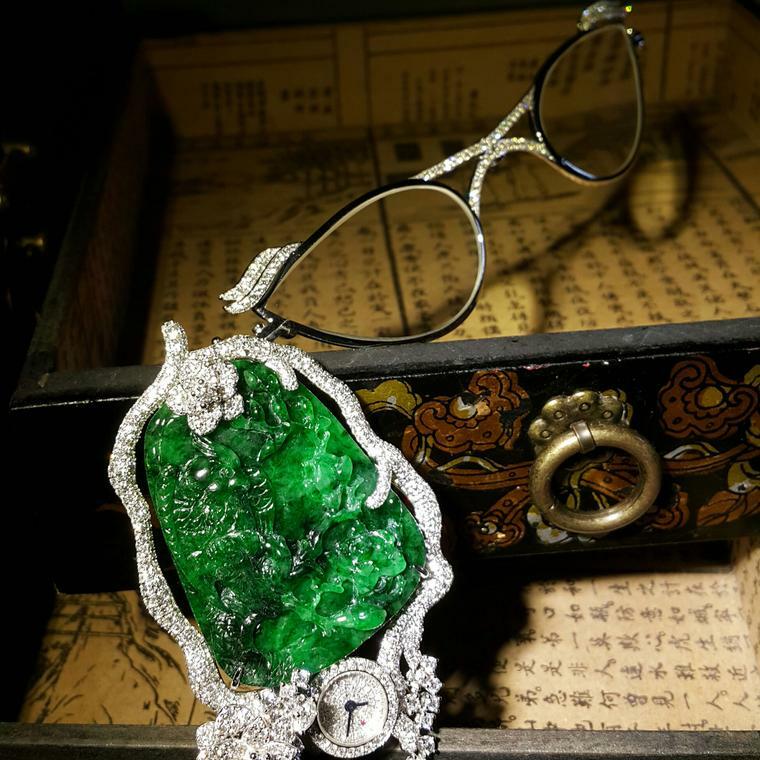 Anita So’s high jewellery rendition of the classic lorgnette hides the eyeglasses behind a large piece of carved jadeite framed by diamonds and a secret watch. If unusual is your thing, then Delfina Delettrez is definitely for you. A modern-day surrealist, she thrives on creating the unexpected for the fashion-forward set. 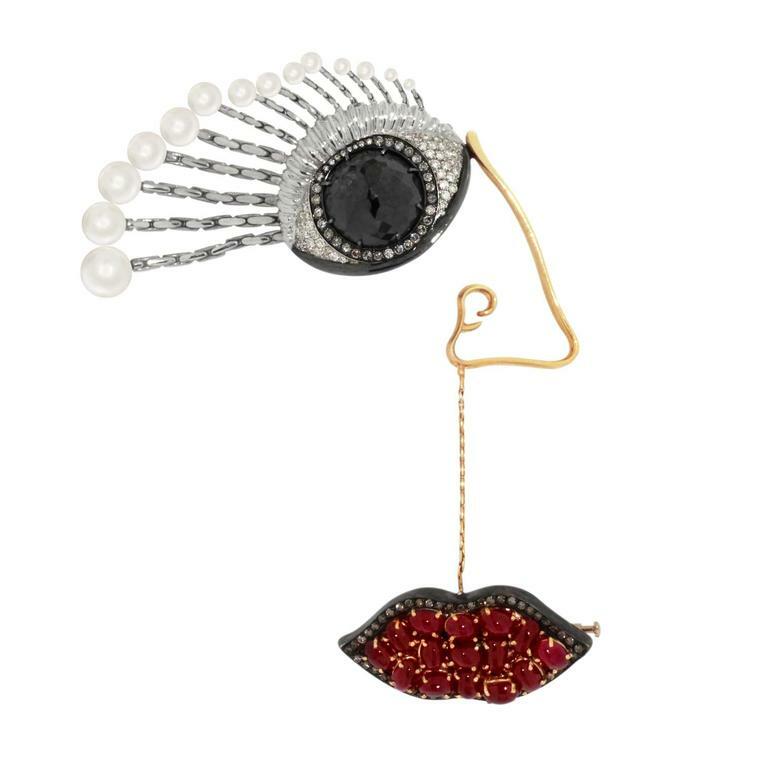 Delfina Delettraz Ana black diamond and ruby brooch with a 30.87 carat black diamond eye, pearl lashes and ruby lips (£30,000). 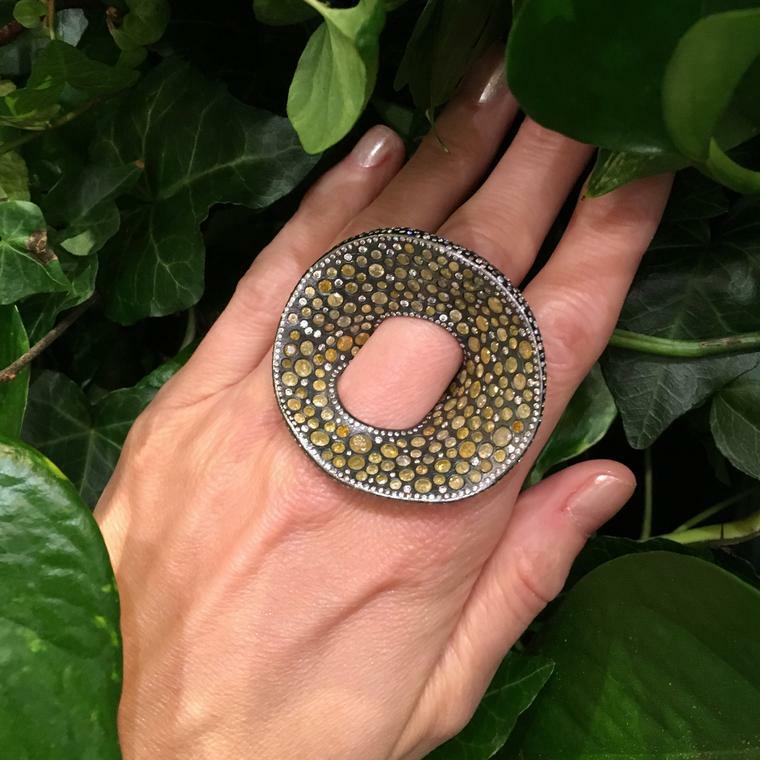 Her Ana brooch with black diamonds and rubies is sure to turn heads even in the most outré of circles or those suffering from jewellery ennui. Geneva-based Suzanne Syz only ever makes one of each of her Art Jewels, often fizzing with Pop Art colours and irony. Her time in New York, where she rubbed shoulders with Andy Warhol, Jean Michel Basquiat and Jeff Koons, has infused her jewels with an irreverence that appeals to women who want fine jewels without the stuffiness. At PAD, London’s art and design show, Syz presented a series of rings, each hidden under hand-blown glass cloches. My favourite was, of course, the most unusual (main image, top). An impressive semi-polished Colombian emerald is invaded by alien life in the form of bright yellow stamens and rich globs of spinel that writhe and twist around the luminous green stone set in green titanium. Brazilian designer Silvia Furmanovich never creates the same thing twice, a sign of a very fertile imagination. 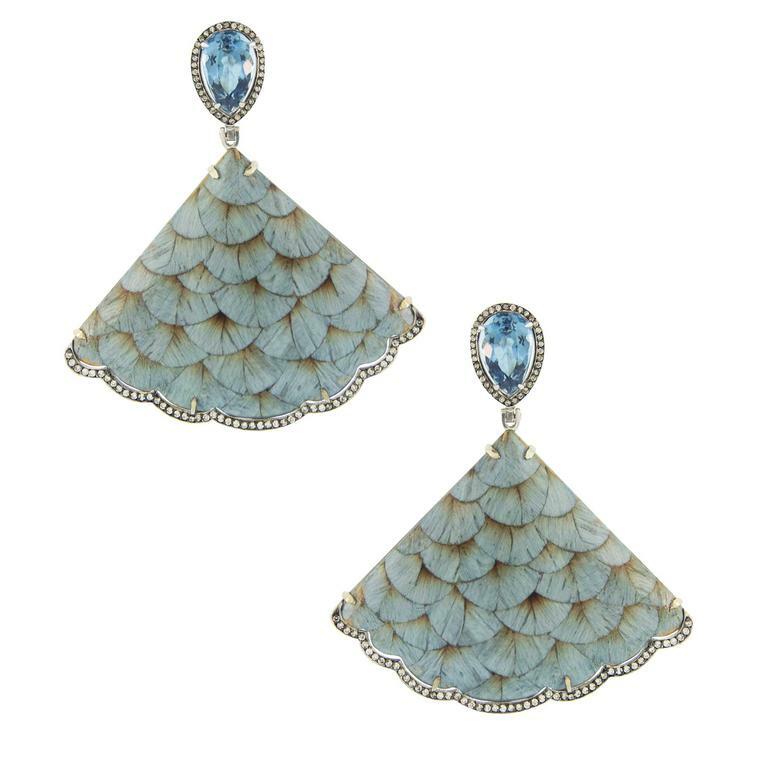 Experimenting with exotic materials, Furmanovich – who in 2015 won a Couture Award for her earrings of orchid leaves preserved in clear resin – brings us earrings made of a delicate pattern of different woods. Known as wood marquetry, this centuries-old craft more commonly found in fine furniture has a new home: dangling from your lobes. Baroque pearls may be as old as time itself, but Margot McKinney gives the queen of gems a vibrant new spin by threading them into long ropes punctuated with beads set with the brightest of coloured gems. 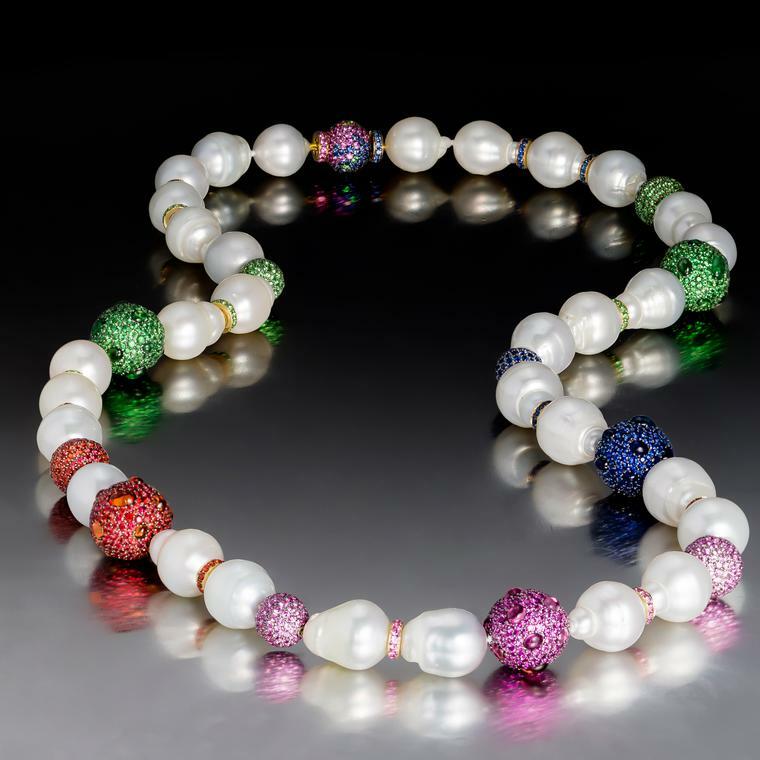 This Margot McKinney opera length baroque Australian South Sea Pearl Strand is broken up with vibrant spheres of colour ($175,000). Little golden spheres erupt with colourful smooth cabochons set randomly against a pavé of emeralds, rubies, garnets, pink and blue sapphires and tsavorites, creating pleasingly irregular forms that echo the swirling shapes of the pearls. Wonderfully whacky, this is what jewellery would look like if Dr Seuss had set his mind to it. de GRISOGONO’s new Folies high jewellery collection puts the emphasis on big diamonds. 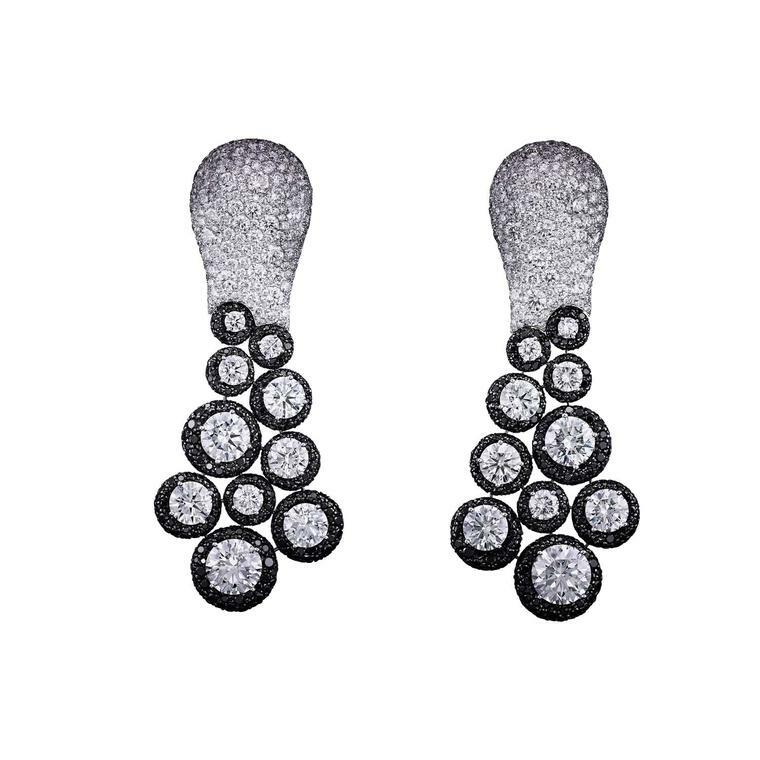 Here, round-cut diamonds are surrounded by the house’s signature black diamonds (POA). Someone had to do it, and it is de GRISOGONO that lays claim to being the first to use black diamonds in jewellery. Reminding us of the Swiss jeweller’s obsession with this dark material, these earrings ooze from the ear like a flow of freshly cooled lava. Arunashi is the man we turn to if we are in need of jewellery excitement. With mind-boggling complexity, lightweight multi-coloured titanium is woven into a swirling, airy, diamond, demantoid and tsavorite garnet-spangled cuff. At the centre glows a candy-bright Tanzanian spinel atop a black opal so smooth it looks positively gelatinous. Encased in milky white cachalong opal, I can’t help thinking this could be an avant-garde hipster confectionary experiment. Fabulous or freaky, we can’t stop looking at it and it would be right at home on the wrist of a princess from a far-away galaxy. Todd Reed, the Colorado jeweller, puts the hippy into fine jewellery, favouring distressed finishes, organic forms and earnestly raw gems. This unusual ring is the result of the collaboration between Todd Reed and Atelier Zobel. It is surprisingly comfortable to wear and a welcome change from tradition. Working with Atelier Zobel of Munich – another jewellery original favouring trippy stone cuts and groovy gold finishes – the Orange Peel ring is the embodiment of barefoot chic. Its subversively clever design makes us wonder why no one had ever come up with such a simple twist on the classic way to wear a ring before. Could this be a big trend in rings? Who knows, but if it ever does, you saw it here first. Opals bring out the alien in more than one jeweller. Perhaps it’s the stone’s otherworldly glow or its mysterious play of colours that sends jewellers into the outer reaches of the galaxy. Jewellery Theatre surrounds a black opal with a sprouts of blackened gold reminiscent of wriggling alien fingers that form an undulating ring of tsavorites and sapphires, below. Defiantly freaky, and guaranteed to scare small children. Whether these jewels are your cup of tea or not, they certainly won’t be forgotten.